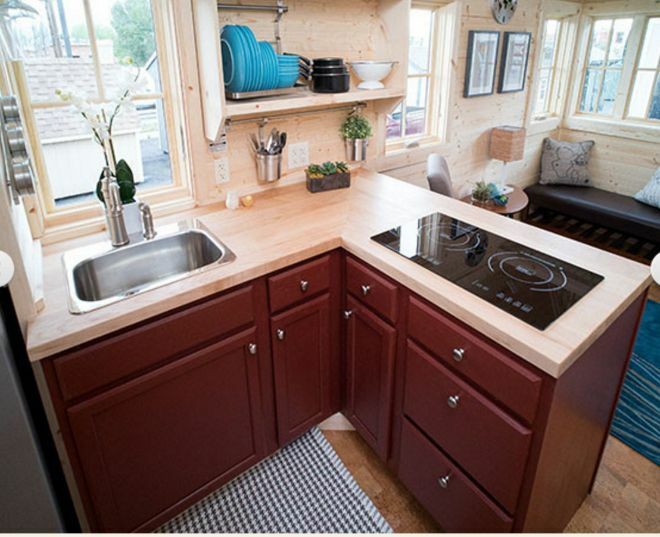 The biggest question asked when looking at Tumbleweed's Cypress Tiny Home is, “how did they do that?” With the number of amenities, space, and style spread throughout this model you'll have to double or even triple check to determine if the size of the home really stays under 200 ft2 (191 to be exact on the longest 26' model). 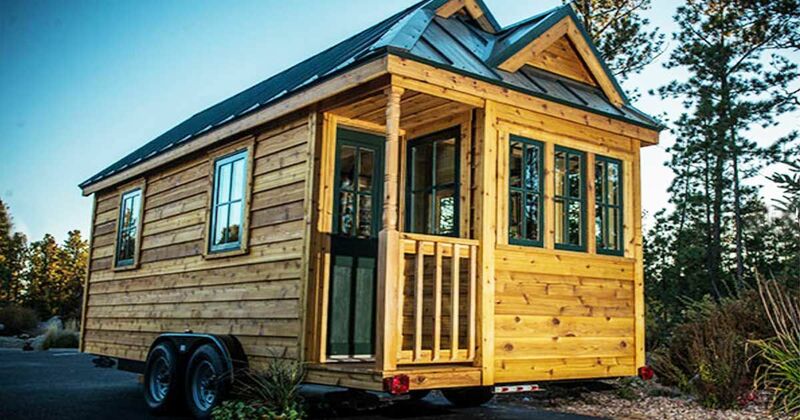 Small home lovers will be familiar with many of the exterior concepts incorporated into the Cypress model from the Tumbleweed Tiny House Company. 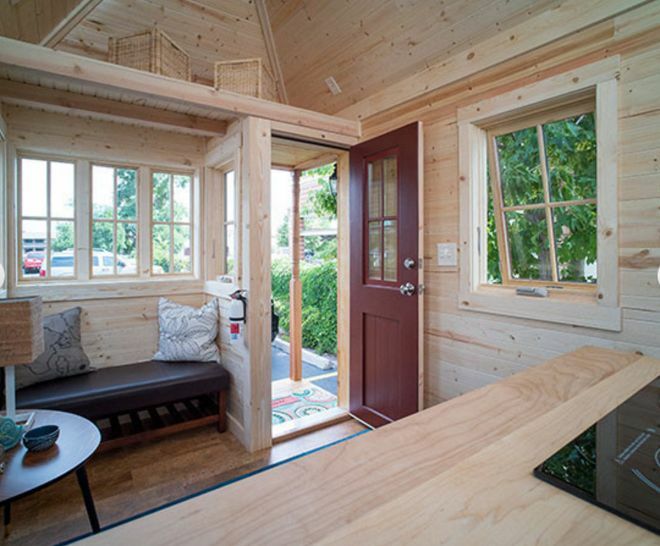 From the cedar exterior siding to the red metal roofing to the inviting front step stoop the Cypress is very similar to many of the tiny homes from various manufacturers in the industry – until you step inside however. Walking in the front door the feature that is immediately noticed is the room. 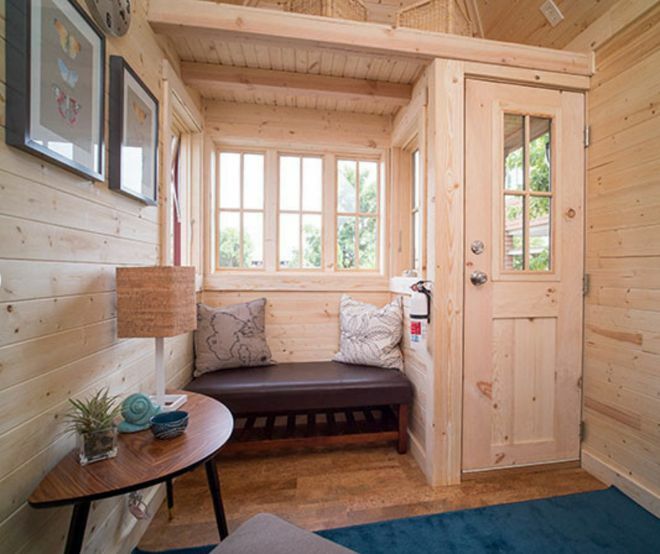 The Cypress has what could definitely be considered a true 'living room.' A comfortable bench sits cozily in the front corner surround by natural light from the aesthetic front windows. The view from the front door looking back shows the true possibilities of the Cypress. 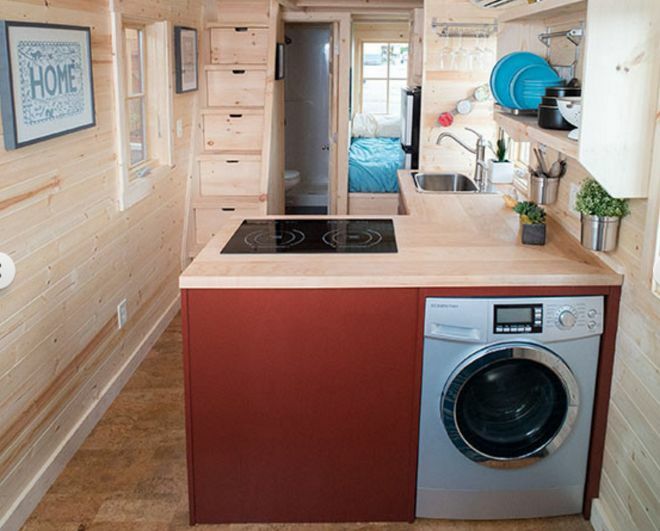 The interior of this model features things that just aren't normally included with a tiny house design including a downstairs sleeping area (straight back and to the right), an L-shaped kitchen island, and even a washer/dryer combo. In a weird way the L-shaped island actually optimizes space compared to if the range and the open counter were placed in a straight line along the wall. 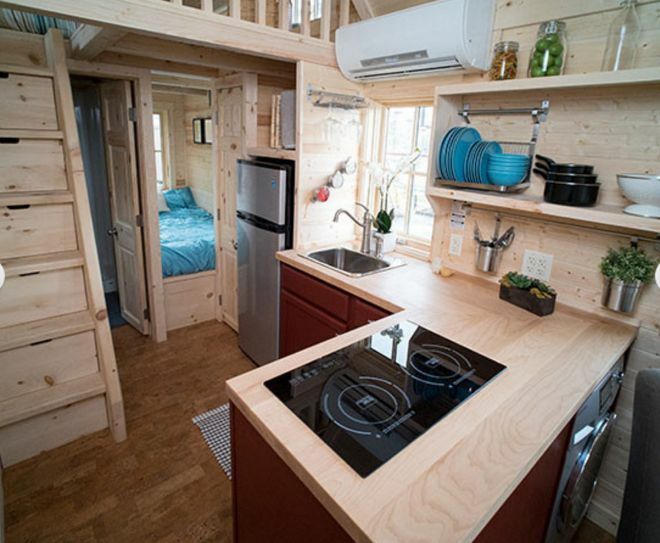 With this setup the kitchen is compact, yet functional while leaving an opening for the living room / entertainment area. There's not a whole lot of free wiggle room in the downstairs sleeping area but it does provide a nice secondary sleeping section. If not outfitted with a bed this spot could serve as expanded storage or a nice home office with some modifications. The bathroom is much more spacious than it would appear. 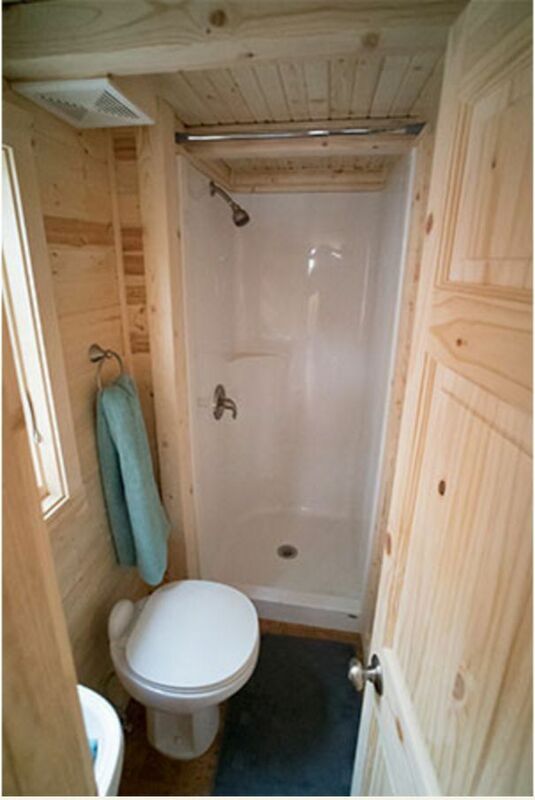 There is a dedicated shower (instead of a wet room), a toilet, and sink which all fit without looking cramped. 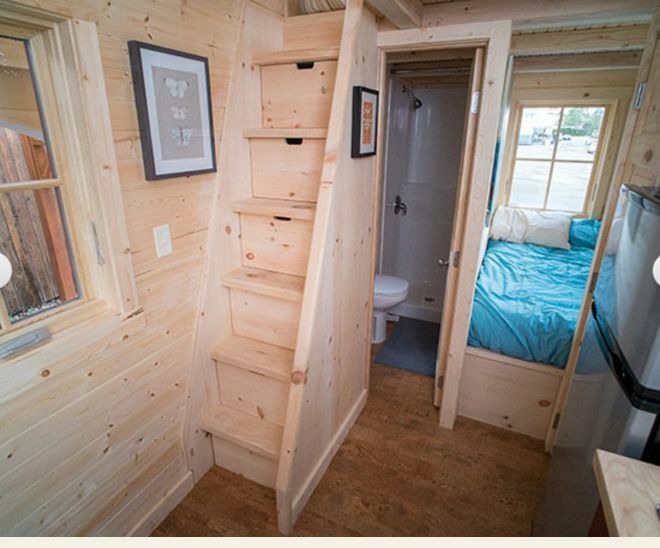 The full bathroom is tucked underneath the main sleeping loft aside from the kitchen. 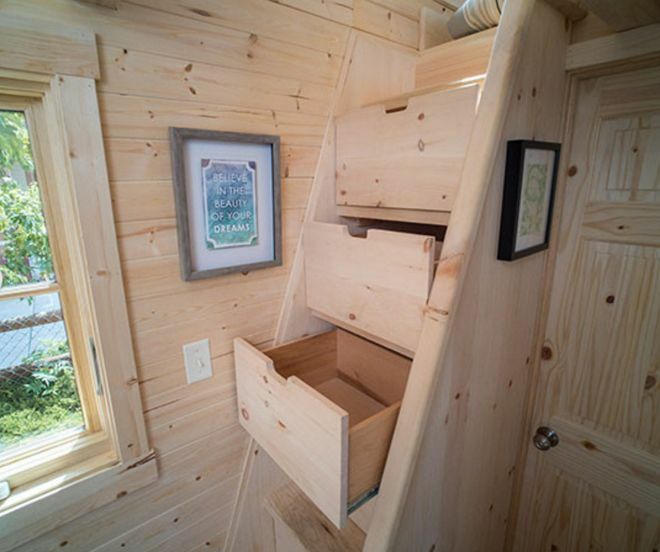 The stairs to the loft are stationary (some people love, others don't) but they pull out for added storage. 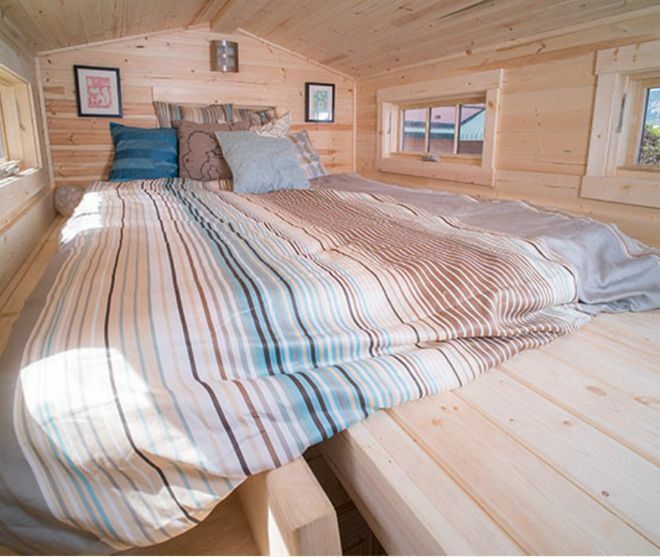 The sleeping loft is 6'8” X 6'10” which leaves enough room for a king size bed with space to spare. 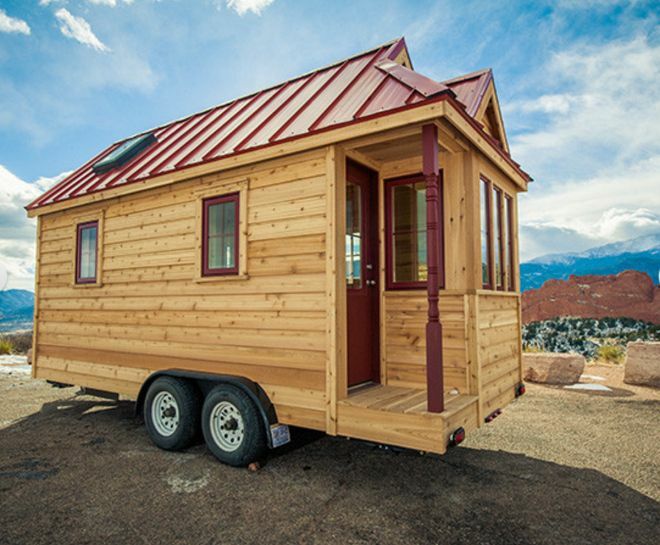 One of the great things about Tumbleweed Tiny Homes is that their homes are fully customizable and made to order. When a customer is able to choose every detail from layout to light fixtures it virtually instantly becomes a home instead of just a house. 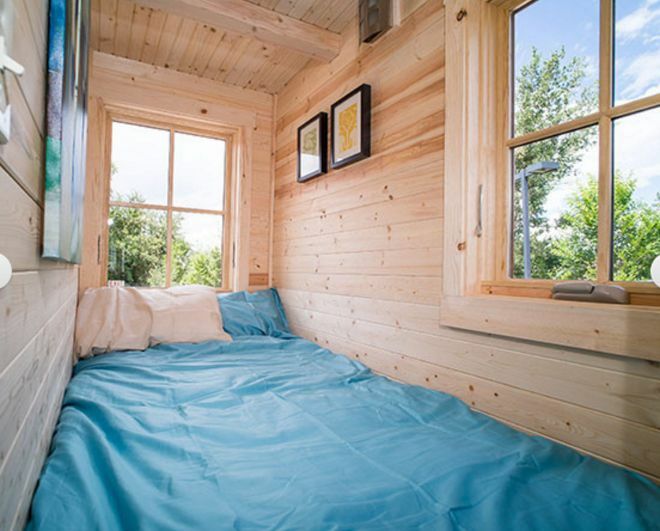 The Tiny Tack House was built by Christopher and Malissa Tack and they've thought of every tiny detail, creating the most comfortable home, no matter they don't have that much room.